Simmer cream, 3/4 cup milk, and half the lime zest in a medium saucepan until mixture is reduced to 1 1/3 cups; set aside. Whisk egg yolks and sugar together in a large bowl until pale; slowly whisk in hot cream mixture. Pour back into saucepan and cook over low heat, stirring constantly, until mixture coats the back of a spoon. Add salt and cool over an ice bath. 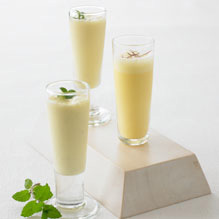 Puree remaining lime zest, lime juice, extracts and mint leaves in a blender; stir into cooled cream mixture. Transfer to the bowl of an ice cream maker and freeze according to manufacturers instructions. To prepare 8 milkshake shots at a time, blend 1/2 cup ice cream with 1/2 cup milk. Pour into 8 shot glasses and garnish with mint sprigs. 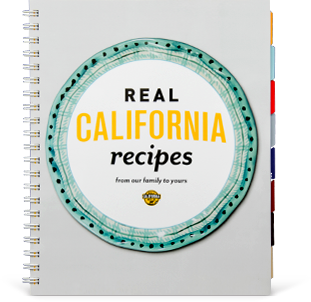 Quick tip: Eliminate the step of making your own ice cream and stir pureed lime mixture into 2 cups of softened Real California vanilla ice cream.